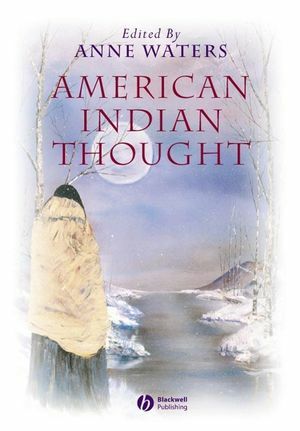 This book brings together a diverse group of American Indian thinkers to discuss traditional and contemporary philosophies and philosophical issues. Covers American Indian thinking on issues concerning time, place, history, science, law, religion, nationhood, and art. Features newly commissioned essays by authors of American Indian descent. Includes a comprehensive bibliography to aid in research and inspire further reading. Anne Waters is Research Associate at the Philosophy, Interpretation, and Culture Center at the State University of New York, Binghamton. Sheis the founder and President of the American Indian Philosophy Association. She edits the American Philosophical Association (APA) Newsletter on American Indian Philosophy and is chair of the APA Committee on American Indians in Philosophy. Among other publications, she is co-editor of American Philosophies: An Anthology (Blackwell, 2001). Part I: American Indians and Philosophy:. 1. Vine Deloria, Jr.: Why We Respect Our Elders Burial Grounds. Part II: Epistemology and Knowing:. 2. Brian Yazzie Burkhart: What Coyote and Thales Can Teach Us. 3. V.F. Cordova: Approaches to Native American Philosophy. 4. John Dufour: Epistemology and Understanding. Part III: Science, Math, Logic:. 5. Gregory Cajete: A Philosophy of Native Science. 6. Thomas Norton Smith: Indigenous Numerical Thought. 7. Anne Waters: That Alchemical Bering Strait Theory. Part IV: Metaphysics and Being:. 8. Ted Jojola: Notes on Identity, Time, Place, and Space. 9. Anne Waters: Language Matters: NonDiscreet NonBinary Dualism. 10. Maureen E. Smith: Crippling the Spirit, Wounding the Soul: Native American Spiritual and Religious Suppression. Part V: Phenomenology and Ontology. 11. Marilyn Notah Verney: On Authenticity. 12. Leslie Nawagesic: The Phenomenology of a Mugwump Life. 13. Anne Waters: Ontology of Identity and Interstitial Being. Part VI: Ethics and Respect:. 14. V.F. Cordova: Ethics: The We and the I. 15. Thurmond Lee Hester: Choctaw Conceptions of the Excellence of the Self, with Implications for a Native Education. 16. Laurie Anne Whitt: Commodification of Knowledge. Part VII: Social and Political:. 17. Steve Russell: Jurisprudence of Colonialism. 18. Dale Turner: Oral Traditions and the Politics of (Mis)recognition. 19. Annette Arkeketa: Repatriation: Religious Freedom, Equal Opportunity, and Institutional Racism. 20. V.F. Cordova: Ethics: From an Artist’s Point of View. 21. David Martinez: Along the Horizon A World Appears: George Morrison and the Pursuit of an American Indian Aesthetic. 22. Thurmond Lee Hester: On Philosophical Discourse: Some Intercultural Musings.